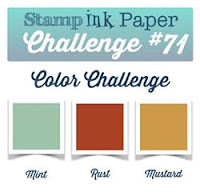 Tina's Crop Shop: SIP #71 Color Challenge! Hello Friends! I'm back over at Stamp, Ink, Paper with my Design Team card based on a color challenge that was a little difficult for me. Look at the colors and let me know what you think?? In theory, I loved the colors together but when I sat down to make something.. I struggled a bit. 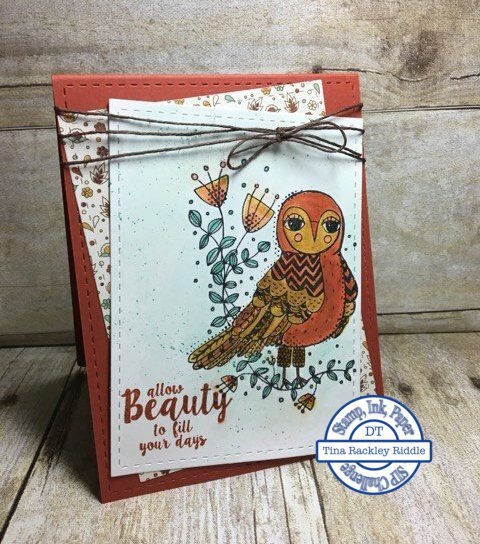 I finally decided that a fun stamp in my February 2016 Unity Stamp Co. Kit of the Month would be fun in Rust and Mustard! I water colored the background in a light wash of the Mint and then added it more saturated in the leaves. I love the sentiment that was also in that Kit of the Month. Unity has some fabulous images and sentiments! I water colored the image with my Aqua Painters in Delightful Dijon, Cajun Craze, and Mint Macaron. I added some splatters with a Coastal Cabana Marker! I cut out the image as well as another rectangle with some Lil' Inker Stitched Rectangle Dies. They also have a Stitched Rectangle that scores the A2 base without cutting so I used that the front of my Cajun Craze base. Hope you love it as much as I do! Did I mention how much I love Unity stamps? ?